Today I’ve taken the Ornaments Infinity Dies and turned them into something new…snowmen! I’ve used these dies in a variety of ways (including Santa and Rudolph here) and I’m really enjoying creating something new with them and getting my money’s worth, lol! This guy just uses the large ornament die for the head and hat and one of smaller ornaments for his nose. I used a scrap of red cardstock and the Hero Arts Circle Infinity dies for the eyes and pompon. This guy uses the same circles and ornaments for his features and hat. I just cut one circle in half for his laughing eyes. These came together super quick and can be used as ornaments, tags or cards. Wishing you a lovely day and holiday season! Categories: Christmas, Clean and Simple, Hero Arts | Tags: chark, Christmas, dies, infinity dies, snowman, snowmen | Permalink. Hi, friends, it’s Chark here today sharing a Santa card I made with my Hero Arts Ornaments Infinity Dies. I think he turned out pretty cute! I used the dies shown below for the deer and for Santa (he has two dies…one red and one white). I cut a rounded slit in the white paper ornament and slid in a kraft circle. I added a little kraft lip to the top of the white piece. On the face, I cut two black ornament hangers for Santa’s eyes. I used the inside of the black ornament hangers for Rudolph’s eyes. I cut circles from dies for Rudolph’s nose and Santa’s pompon. I took the black circles from the ornament hangers and use as Rudolph’s eyes. I added clear Nuvo Clear Crystal Drops to both character’s eyes and Rudolph’s nose. For the background piece, I first watercolored the card and after it dried, I placed the stencil down and used a slightly different watercolor. After that dried, I used Nuvo Aquamarine Mousse (love this stuff!) with the same stencil on top. I had a lot of fun finding new uses for my Ornaments Infinity Dies! I’m entering this one over at A Blog Named Hero for their Winter Holiday Challenge…join me here if you love your Hero Arts! Categories: Christmas, Handmade Cards, Stencil, Watercolor | Tags: chark, Christmas, dies, infinity dies, ornaments, rudolph, santa | Permalink. Hello! Yes, it’s the one-trick-pony Erica back on the blog, with… *drumroll*… another card using texture paste and Hero Arts stencils! Ta-Da! After this post, I promise I will do something different. Absolutely. Most definitely. Almost positively sure. Maybe… just one or two more? It is just so much fun!! For this card I thought I combine ink blending and texture paste to add lots of dimension and interest to a rather simple design. I started out by getting some water colour card stock out and I taped it down to a sheet of clear acetate. This is to use both as a mop-up of any ink blending messes and also as a sort of palette for my mixing of the texture paste and ink. I used the Hero Arts Large Flower Stencil (which is sold out in the shop but if you want to order it, use the ‘request custom order’) but the Hero Arts Spiral Stencil would look fab too. Starting out, I dotted Fossilized Amber Distress Oxide ink in the middle and for the petals I used Picked Raspberry Distress Oxide ink. I didn’t make it very vivid as the idea was to have a light colour underneath and then mix the texture paste with some ink for highlights on some of the petals. To mix the colour and the paste, I simply dabbed my ink pad on the acetate and then mixed a bit of Ranger Ink White Texture Paste with my spatula. I didn’t mix it overly well as I wanted both the white and the pink to show. Using the spatula I spread the paste on selected petals, going from the middle and outwards. For the middle, I did the same thing with the yellow ink and the paste but this I mixed up very well before I dabbed it on rather than spreading, to get LOTS of texture. Lifting the stencil is alway the most fun part, as although you have a general idea of how it is going to look, it’s still a revelation! As the flower was looking rather spectacular I didn’t want to cover up too much of it so sentiment wise I went really simple. 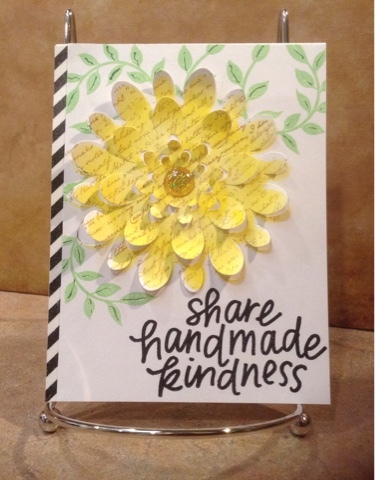 A single word stamp and die set from The Ton Stamps that says ‘hugs’, which I cut out from yellow card stock and stamped the sentiment in Picked Raspberry Oxide Ink. I also added a few of the circles and some sequins that matched the pink ink almost perfectly. When I was looking for the perfect card base for this card I almost went with white, but then I spotted some Lawn Fawn card stock in Guava and thought it would be perfect to add just a tiny bit of accent to the card. I chopped off a thin sliver of the card panel and added it to the card base using double sided foam sheet (cut to perfect size) for a bit of dimension and to add some subtle detailing. And that my friends, concludes this months third texture paste/embellishment mousse cards! I’ve tried to show different techniques to lure you into the wonderfully messy world of texture paste and I’d love to see what you come up with. Pop a picture in the comment section if you want, sharing is caring after all. The a2z scrapbooking store carries a wide variety of Hero Arts products! Get discounted new releases, sales, grab bags & more. Proceeds from our store benefit Celiac & Behcets disease foundations. Use my discount code Erica15 to get 15% off your purchase of $25 or more. If you’re looking for a Hero Arts product you don’t see in store, use the Request Custom Order button from with-in the shop. Categories: Flowers, Friendship Cards, Handmade Cards, Hero Arts, Stencil | Tags: dies, Distress Oxides, embellishment mousse, Erica, ink blending, sequins, Techniques, texture paste | Permalink. Hi, Friends, it’s Chark today with a felt project. I needed a new pin for my coat after the Santa pin came off so I decided to try making a butterfly pin. After die cutting butterflies from felt in different colors, I put two together and added some rhinestones. You can sew or use fabric glue to adhere the butterflies together for these pins. I suggest hot glue to attach the pin back, since it just needs to be strong and not pretty. I love trying different materials with the dies and have used wood paper, acetate, felt and cork. So far, they all cut beautifully with the Big Shot. Hope you’ll try some fun die cutting soon and remember, you can enter that or any other Hero Arts project in our January Anything Goes challenge here. Categories: anything goes, Gifts & Gift Wrap, Jewelry | Tags: butterflies, butterfly, chark, die cutting, dies, felt, Jewelry, pin | Permalink. Hello friends! Monica here stopping in to share a little tag I made for our December challenge. I die cut my tree out of some scrap green paper I had lying on my desk. I also used some scrap pieces of cardstock for the embellishments. Once everything was adhered to the tag I added some Nuvo for the accents. If you are in need of any items from the a2z Scrapbooking store you can use code MONICA15 at checkout to receive 15% off your purchase of $25 or more. (before tax and shipping) And don’t forget that we are on Twitter, Instagram and Facebook. Follow us on these different social media outlets so you won’t miss out on any fun promotions! You can also chose to request a custom order if there is something you don’t see in the store. Categories: Hero Arts, Tags | Tags: Challenges, dies, Tags | Permalink. I thought some detailing might be nice to bring out an elegance to this set and I’m really amazed that I think I succeeded. A little embellishment is sometimes all you need. I made two cards with two different colored coffee cups, but the same embossing folder, stamps and stickers. I hope you like these as much as I do. I put Wink of Stella – GL White on both cups on the foam part. The bronze seems to have pulled the white around and it looks like a foamy or creamy froth mixed with strawberry. I guess it could be foam on a coffee – obviously, I know nothing about coffee. I know this seems dark and strange. If I can get a better photo, I will. The coffee cup paper is a shinny bronze with Cup O”Joe inked on the stamp. It reminds me of a creamy strawberry cream on top. One of the cups has glass gems. Be sure to check out our sales/ retired section for 50%- and more off! You can use the discount code or the Free Shipping Code for extra savings! Hope you’ll join in our November Challenge of “Embellish It” with your Hero Arts stamps, dies and stencils. And, if you need some new supplies, don’t forget to shop at a2z Scrapbooking. Categories: Christmas, Handmade Cards, Hero Arts, Thanksgiving | Tags: 2016, a2z Scrapbooking, Arlene, dies, Hero Arts, stamping, stamps | Permalink. Hi, all, just a quick post to announce our June To Die For Challenge Winners. First, thanks to all who entered, we had such beautiful work this month! Our winner of the $25 gift certificate to the store this month is Maura with this beauty! The colors are striking and the fun stamping and distressing make the butterflies really stand out–and did you notice the glitter on the wings? Perfect touch! Please email a2zscrapbooking@comcast.net to claim your gift code. Our runners-up win a blog badge and bragging rights to tell everyone how much our DT loved their entries! Just email the above address to ask for your blog buttons. Helen, who is now on the design team, entered the June contest before being chosen for the team and made this lovely card. It has the right touch of red to really stand out with the kraft and white, always a great combination! Our next runner-up is Cecilia, with this amazing mix of brick wall and vellum butterfly, both embossed in platinum. What a unique combo she made–the brick texture with the softness of the butterfly is really well done! Our third runner-up is Kim H. with a different butterfly die and a wonderful shaped card– this is a lovely color combination and the sentiment matches the lighthearted feel of this card perfectly! We’re so happy to see the entries each month and see what Hero Arts-inspired projects you make. 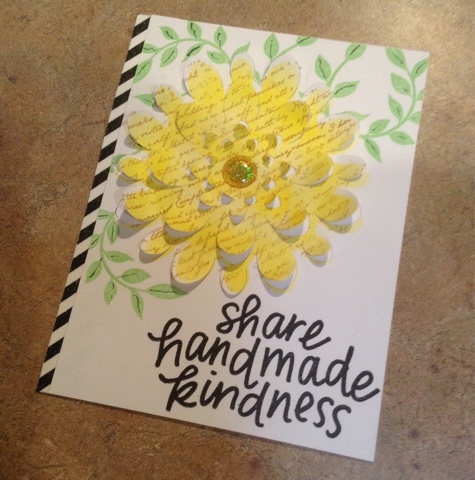 Also, thanks for visiting the blog and shopping the store, we appreciate your support of the charities that every purchase at a2z Scrapbooking helps! You rock! And Congrats to our winners! Don’t forget, we have a July challenge you might want to break out your HA products and enter and maybe you’ll see your name announced next month! Categories: Challenge Winners, Challenges, Handmade Cards, Hero Arts | Tags: Challenge Winners, die cuts, dies, june winners, winners | Permalink. I used the Hero Arts D1159 Paper Layering Mum to make a mask and used the negative to sponge yellow ink, then lightly stamped a script stamp from my stash on the petals within the negative mask. I then masked the flower and added leaves from the Hero Arts Cl949 You’re So Lovely stamp set in green ink. I highlighted the center veins with darker green marker and added a gem in the center. The sentiment is from Hero Arts CL922 Acts of Kindness set from Jennifer McGuire, stamped in Hero Arts black ink and heat embossed with Hero Arts Clear Embossing Powder. Lastly I added a strip of black and white washi tape down the left side. If you need craft items, don’t forget you can just special order from the A2ZScrapbooking Store. You can use the code Angie15 to receive a discount of 15% of your total order of $25 or more excluding shipping at the A2ZScrapbooking Store. Don’t forget we are on Twitter, Instagram and Facebook. Follow us on these different social media outlets so you won’t miss out on any of the promotions! Categories: Handmade Cards | Tags: a2z Scrapbooking Store, Angie, Challenges, design team, dies, embossing, embossing powder, Hero Arts, stamp sets | Permalink.